Gourmet Basket hampers deliveries are the ultimate in convenience. We offer beautifully presented, award-winning produce you can trust they will love! To ensure your gifting experience is a breeze, we are excited to offer a new Click & Collect service from our warehouse in Belrose, Sydney. Simply order before 2.00pm Monday-Friday (or any time weekends) and pick up Same Day before 5.00pm, or choose any other date. Offering convenience and flexibility, Click & Collect allows you to order items on line, and then collect them in person from our Sydney location when it suits you. Step Three: Jump in the car and come see us! Your gorgeous hamper will be waiting with our Gift Concierge! 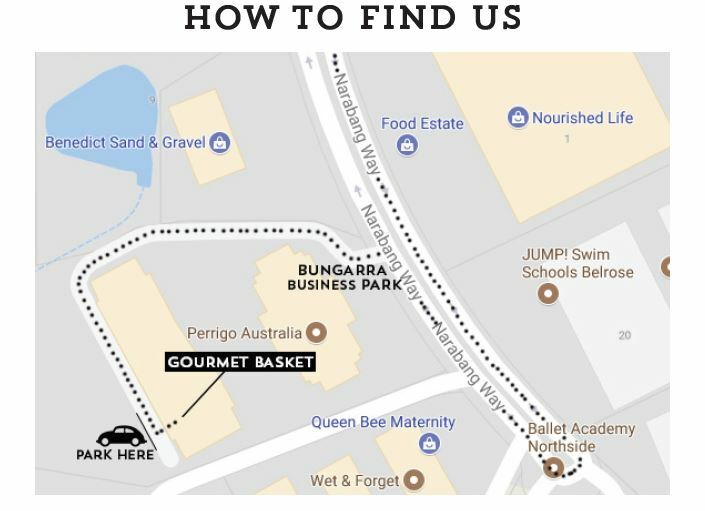 Collect your order from our Gift Concierge at the Gourmet Basket Warehouse. We are open between 9am and 5pm, Monday to Friday. Please note; we are closed on public holidays and weekends. Simply following Narabang Way around until you see Bungarra Business Park sign. At the entrance of the carpark, turn right and continue to the bottom of the hill. We are at the end of the driveway on your left!